Posted under Quizzes. Updated 2 September 2015. 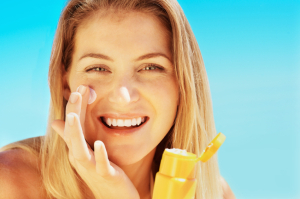 Take our quiz to see how much you know about sun safety! 1. To protect skin against all types of sun-induced damage, you should choose a sunscreen with a sun protection factor (SPF) of what number or higher? 2. Sunglasses with dark lenses offer better protection from ultraviolet rays than sunglasses with lighter lenses. True or False? 4. Wearing sunglasses with 99 to 100 percent UVA and UVB protection doesn’t just look cool; it can also protect you from developing cataracts. True or False? 5. Sunscreen never expires. True or False? 7. How should you treat sunburn? 8. You don’t need to wear sunscreen or sunglasses on cloudy days. True or False? 10. People with darker complexions do not need to use sunscreen. True or False?